The Driver Suit Blog-Auto Racing Collides With…Golf? I’m not a golfer. I don’t play gold, though I do watch The Masters every year. You know who does play golf in their off-duty hours? Many race car drivers play golf. The quiet course, and calming effect that the game has is a great way to calm down from the noise of the race track. Golf companies like to use cross-promotion to help promote their products. From sponsoring celebrity players and tournaments, to sponsoring race cars, golf companies understand that people love the sport. Founded in 1979, TaylorMade first made a 12-degree loft metalwood. By 1997, the company had made millions, and Adidas bought the company. By 2006, they became the second golf company to earn over a billion dollars. In 2005, the company focus shifted to taking over the driver market, which has proven to be a great move. One such driver is the R1, which was introduced in 2013. 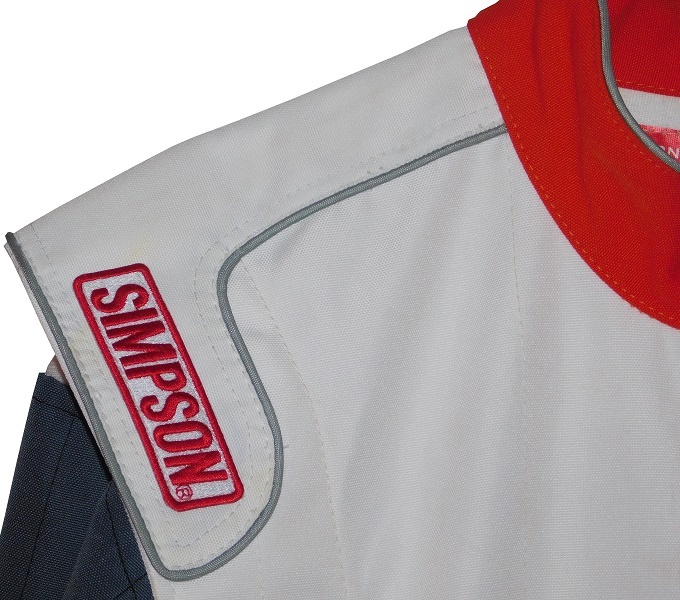 To promote the release, this R1 Simpson karting suit was made, for some promotion that has been lost to history. When I first saw the suit, I thought that it was for when Chad Head was sponsored by TaylorMade for the 2015 Circle K NHRA Winternationals. I knew it wasn’t a driver suit, but I thought that it was for promotional purposes. After looking into it, I realized that the car was running a TaylorMade Areoburner scheme, and Head was wearing his normal suit, made by Stand 21. While I have found evidence showing that TaylorMade did some golf cart racing, I haven’t been able to find proof that this suit was used in a golf cart race. This suit exists, but for what, I guess I’ll never know. 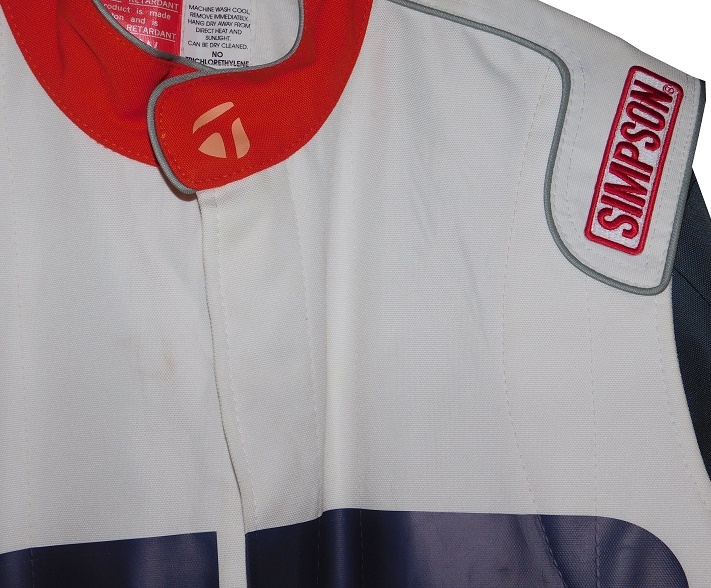 This non-Nomex suit shows some wear with scuff marks and stains. 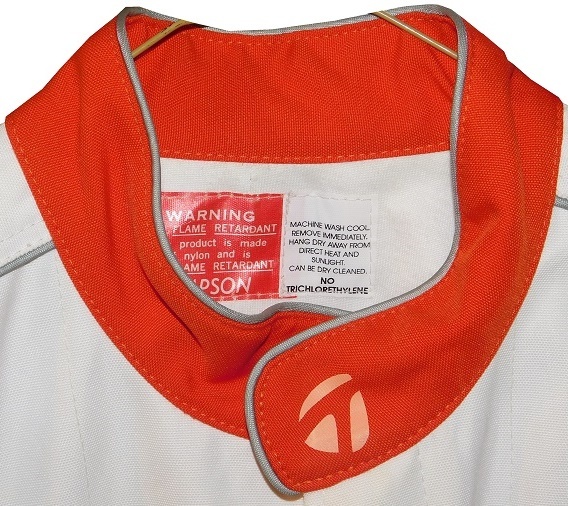 The collar is of the standard variety, and has a TaylorMade logo heat-pressed into it. 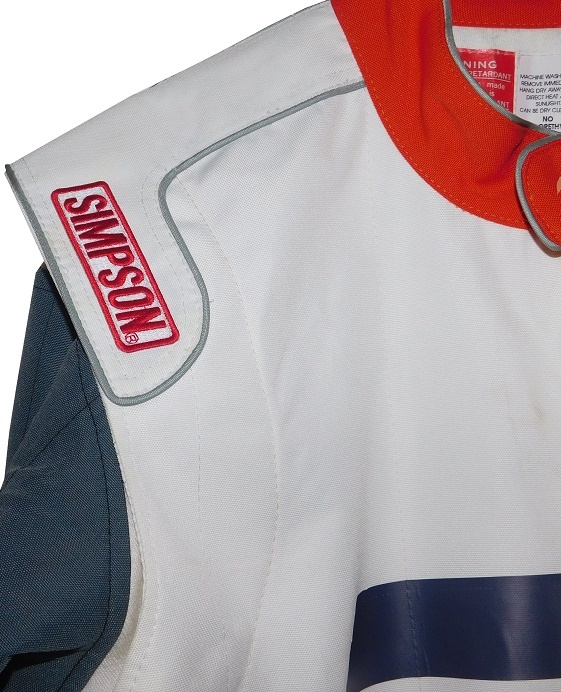 The cowl has a Simpson non-Nomex warranty tag, as well as a tag with washing instructions. The upper chest has no adornment to speak of. 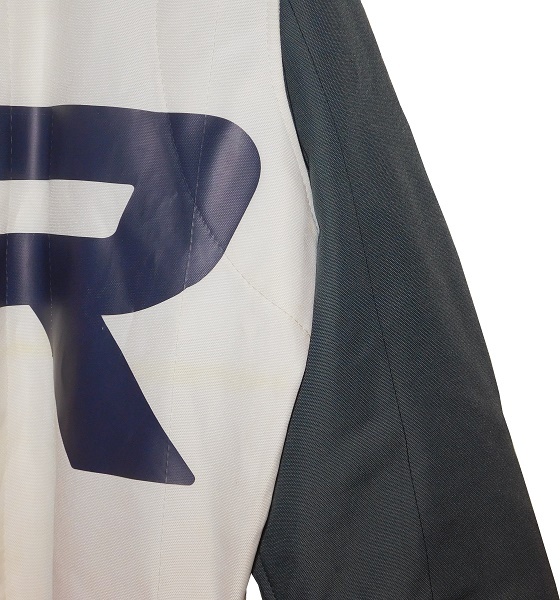 The front torso has a large orange and green R1 logo heat pressed into it. 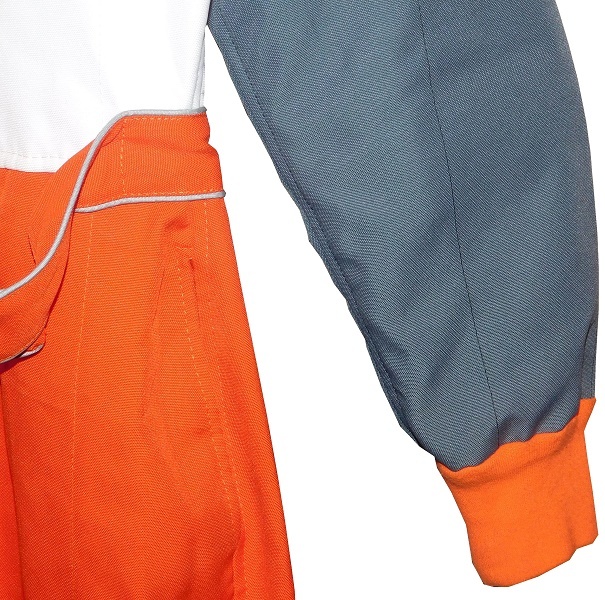 The suit has an orange belt, below the white torso, and the belt is unadorned. 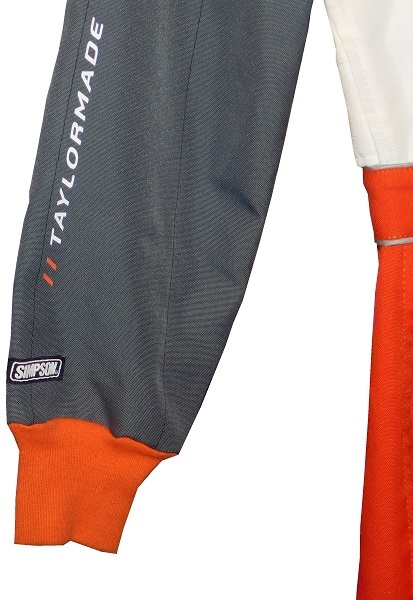 The orange legs have a white TAYLORMADE logo and wordmark heat-pressed into the left leg, in television position. For some reason, the right leg is unadorned. 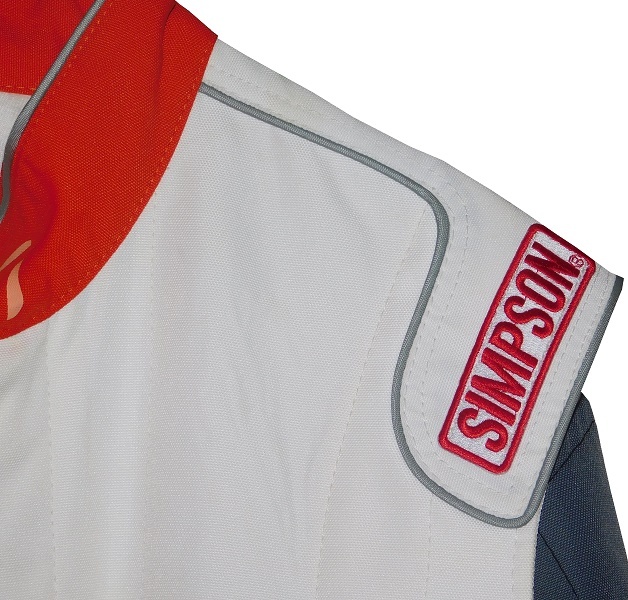 The shoulders have white epaulets, outlined in silver, and aside from SIMPSON logos, are unadorned. 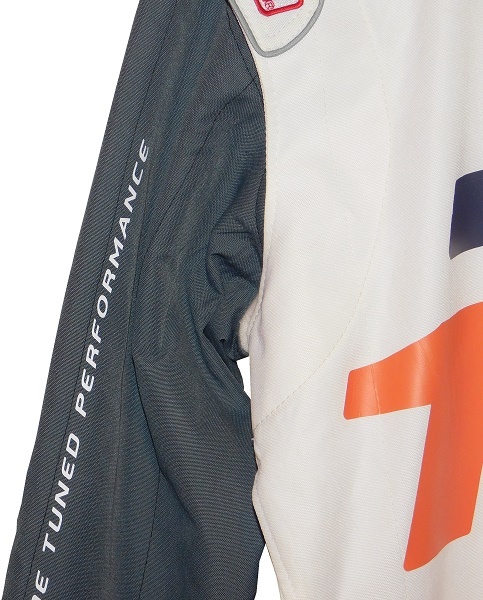 The sleeves are in green, and the right sleeve has TAYLORMADE TUNED PERFORMANCE heat-pressed into it, though the placement could be considered television position for open-wheel cars. The left sleeve is unadorned. 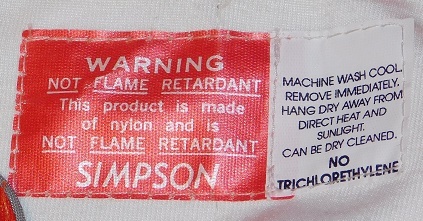 The back of the suit shows some light scuff marks on the white material. The orange collar has no adornment on the back. 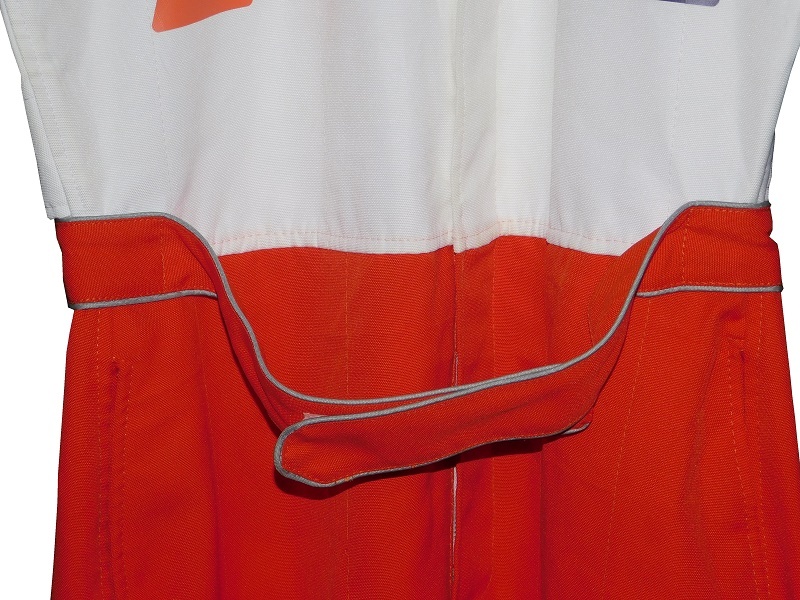 The back torso shows some light scuff marks on the white material. While I get the idea of golf companies using racing to help promote their products, I would still love to know what this suit was used for. For most of my collection, racing and non-racing, I at least have the knowledge of what this item was used for. This is one of the few items where I don’t know where, when, and why it was used. Sometimes in life you can get this information, sometimes you can’t. Next week, I’m doing an article on the US Open.